I have a steady flow of baseball players who come to see me for shoulder and elbow rehab. As a former pitcher whose playing career was altered by an arm injury at age 14, I have a particular interest in throwing injuries. 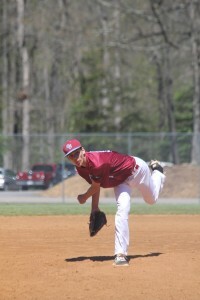 My son is a 6’2″ left-handed pitcher that plays showcase baseball. He will be the subject matter of this post moving forward. Many of the players I see for shoulder and elbow pain suffer from pathological GIRD (glenohumeral internal rotation deficit). While it is common to see throwers with less internal rotation on their dominant side, it is important to assess total shoulder motion to make sure their mobility is within 5 degrees of their non-dominant side. Asymmetry in total shoulder motion and shoulder flexion increase the odds of elbow injuries. Click here to see the correlation in professional pitchers. Additionally, insufficient external rotation gain on the throwing arm increases injury risk. Click here to read an abstract summarizing data within the same group of professional pitchers. Given this information and my background, I have preached arm care for years to my son. For some background, my son has pitched since he was 9 years old. 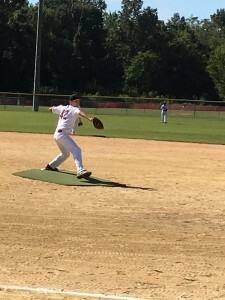 Since I have been a coach for his team in one capacity or another since he was 10, I have closely monitored and controlled his pitch counts, innings per outing and total innings per year. He has always been able to throw hard, but he had a big growth spurt in middle school and his velocity grew with that. He now throws between 75-77 mph as a HS freshman. He is projected to be 6’5″ tall and weighs 170 pounds at this time. His showcase coach pitched in MLB, and we have two other organizational pitching instructors with big league experience who supervise his weekly bullpens. His total innings pitched for 2017 = 43. Research indicates anything over 100 significantly increases injury risk. With all that said, he has developed some medial elbow pain over the past 4 months. He has no history of arm trouble to date. My intention is for this post to serve as useful diagnostic and proactive intervention for those who may see and experience similar cases. Spring training has begun, and youth baseball players all over the country are starting to practice and prepare for their upcoming seasons. My very own 14 y/o son has started his 8th grade season, while having been working with his travel team on the weekends since mid December. As a physical therapist, former player, father, and assistant coach on his 14U team, my first concern is always the health of a player. I see several baseball players in my sports medicine practice ranging in age from 9 year olds to MLB platers. Diagnoses include internal impingement, SLAP tears, little league elbow/shoulder, OCD, UCL sprains, rotator cuff tendinitis, instability, fractures and scapular dyskinesia. One of the hardest things to do in my profession is get inside the head of a young athlete. Many will refrain from mentioning pain for fear of letting down a parent or coach, or out of concern for losing playing time. Society has become too focused on early specialization and winning from an early age. In addition, “travel baseball” has been somewhat diluted and water down by lots of dads who want their sons to play year-round. I often see kids being abused on terms of too little rest or improper recovery after they pitch and catch. The biggest, most athletic and hardest throwing kids undergo the most strain as they are asked to shoulder the load at pitcher, catcher and shortstop early on. Many coaches are counting innings in tourneys and not pitches based on tournament guidelines. Too many kids are pitching on consecutive days without proper rest all in an attempt to win meaning less tournaments at a young age. Fortunately, we are making progress in the sports medicine world thanks to the efforts of Dr. James Andrews and others. High schools are adopting pitch count regulations this year, and MLB along with Dr. Andrews has developed their site, www.pitchsmart.org, to spread education about injury prevention in youth pitchers. Dr. Christopher Ahmad is on the advisory committee for PitchSmart.org, and he is also the lead author on a new paper detailing an injury assessment tool for young baseball players, The Youth Throwing Score.